Electrolytes: substances that when dissolved in water split apart, or dissociate, forming ions. When a substance ionizes in a solution, those ions or charges can conduct electricity. Therefore, an electrolyte can also be said to have electrical conductive properties. But not all electrolytes are created equally! They can be classified as strong or weak electrolytes, depending on how well they conduct electricity. 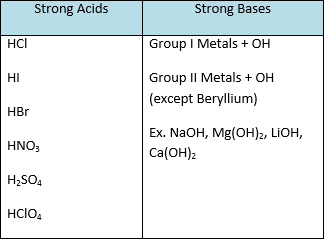 Types of Compounds: soluble salts (ionic compounds made of a metal—or ammonia NH4 – and nonmetal) and strong acids and bases. Type of Compounds: alcohols (contain OH, names end in “ol”), sugars (CH2O type formula, names end in “ose”), biological compounds.